Hectic work schedules and tight training budgets create a significant training problem for SAP professionals. 25% of SAP professionals report that they don't have enough time for SAP training. This is especially true when the training is organized into day-long classroom sessions. While there are challenges, training is still needed. In fact, 53% say they need more than 30 additional hours of training to do their jobs correctly. The difference between training received vs. needed is the so-called training gap. 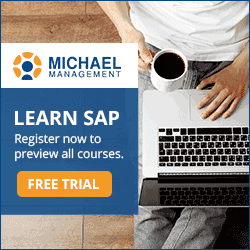 Online SAP training by Michael Management offers a solution that's affordable, quick and efficient. More infographics: Why SAP certification matters.